Home Reviews Dell XPS 15 9570 Review: The Best High-End Windows Laptop? Dell’s XPS lineup has always been seen as the pinnacle of PC design, ever since the company began making the series. 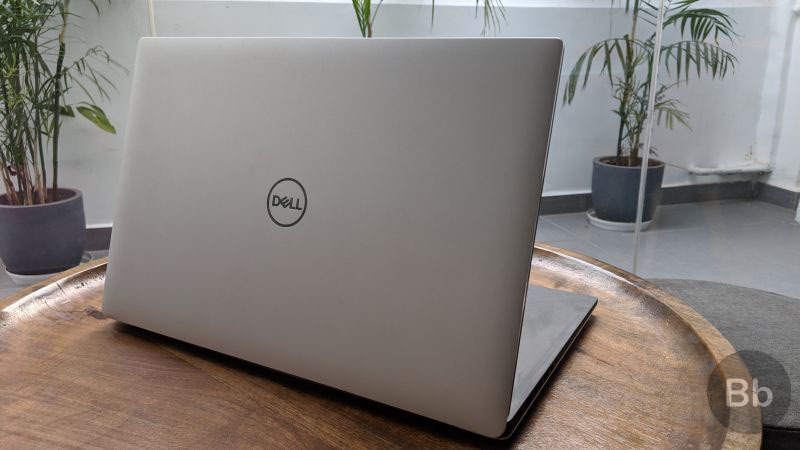 While it used to be Dell’s gaming-centric line-up when it first arrived on the scene, the XPS series has morphed into productivity beasts in ground-breaking slim bodies as well as interesting design flourishes. The 2018 lineup is led by the Dell XPS 15 and since the company hasn’t yet refreshed this model for 2019, it’s still top of the pile within the company’s portfolio, and top of mind for many potential buyers. 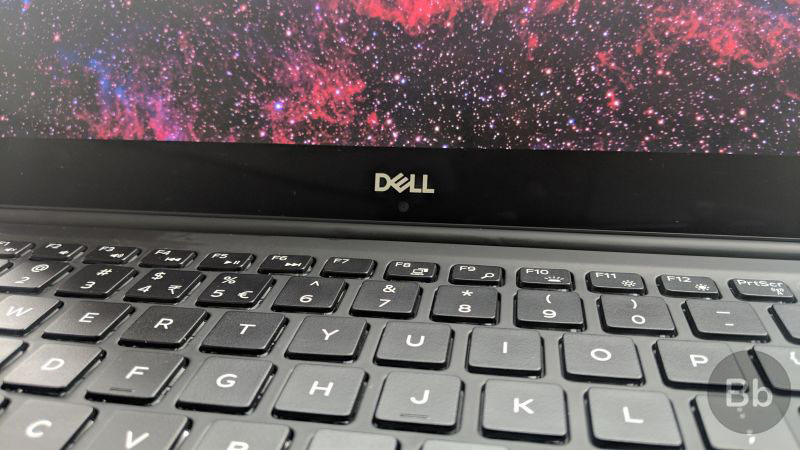 Dell added the hexa-core Intel Core i9 to the XPS 15 (9570) last year, and took things to a whole new level. This variant with a stunning 4K screen, 32 gigs of DDR4 RAM and Nvidia GTX 1050Ti graphics is overkill in the name of a computer. Who really needs such power on the go and is it worth the astounding asking price of over Rs 2 lakh in India? 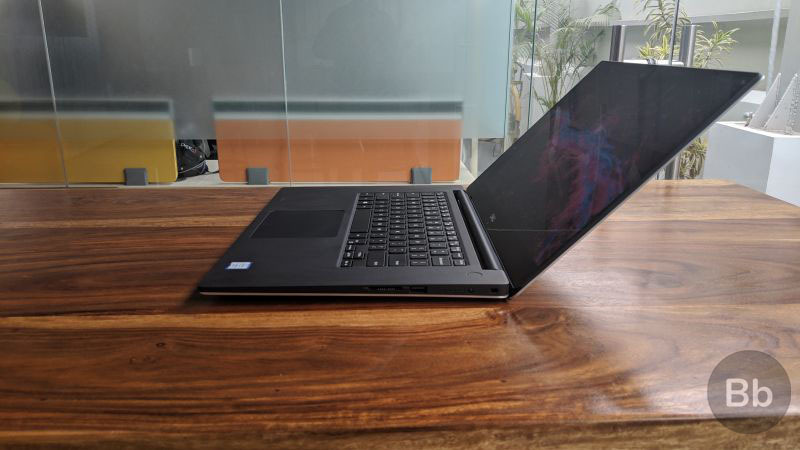 If you have seen the older 2017 model of the XPS 15 or the 2018 XPS 13 9370, you would be more than familiar with the design and build quality of the XPS 15 9570. 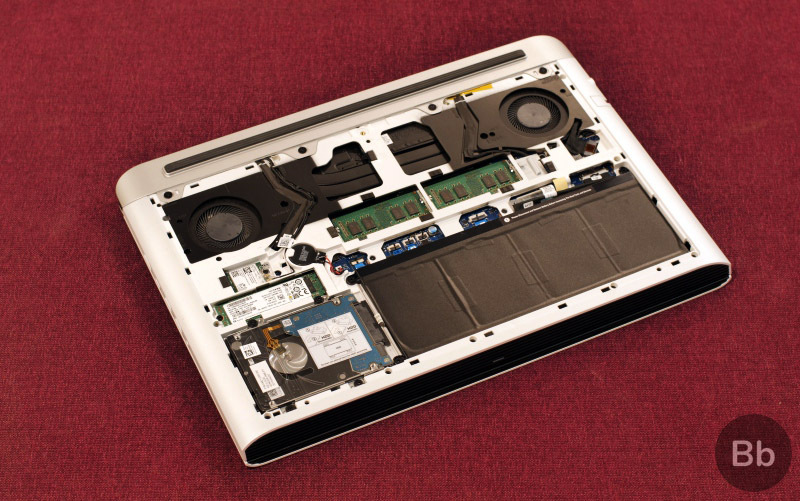 The laptop is densely packed, built using top-notch materials and the assembly leaves little to be desired. It’s easily one of the best-looking premium laptops in the world, and that includes the new Apple MacBook Pro. 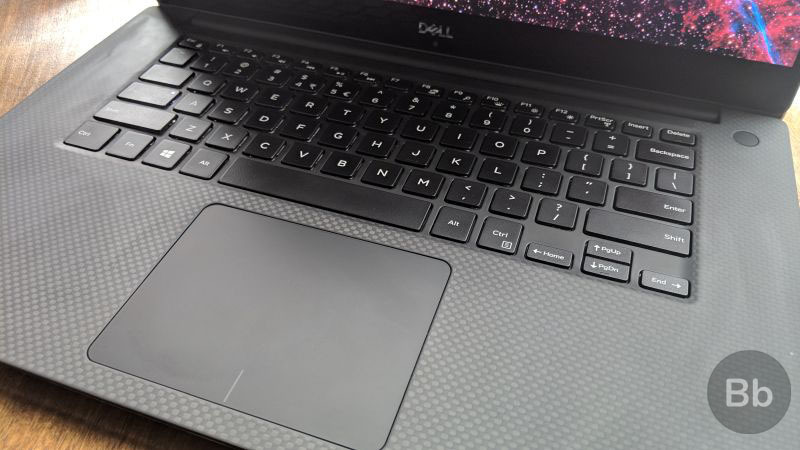 While the top and bottom of the laptop are crafted from a single block of aluminum, Dell has gone for its signature carbon fiber material for the middle section, which includes the top of the keyboard deck. This soft, almost-rubberised material extends to the very top of the keyboard deck, wrapping around the Function row and just ending at the hinges. As a result, using the XPS 15 is quite unlike any other laptop. Overall, the XPS 15 brings superb construction but opening the laptop with one hand is not the easiest thing. That’s because the lid itself is quite a bit thinner than the base, as is the case with most laptops and you have to pull the lid up exactly from the middle. As you would expect, there’s little to no flex in the display or the keyboard deck. This is one densely built laptop. That also means it digs into your wrists rather dramatically. If you have sensitive skin, which gets cuts easily, you may want to hold off on pressing down on the keyboard deck with your wrists. The sides of the laptop too present some problems as the aluminum can end up snagging against your skin if you handle it a little too aggressively. 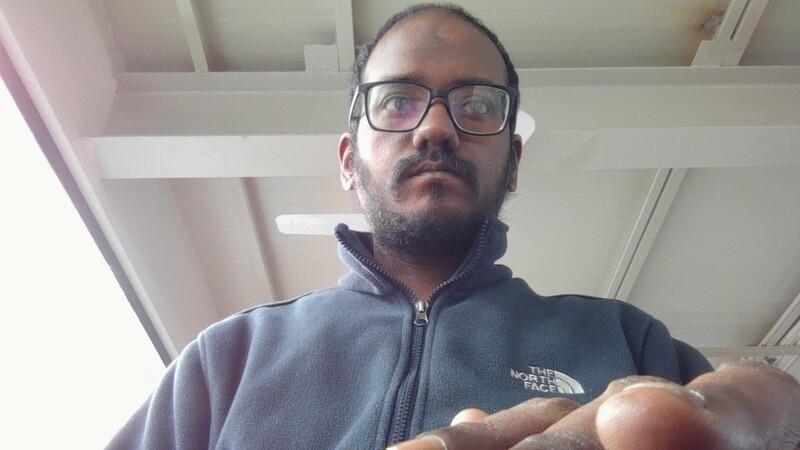 When talking about the bezel-free design of the display, one has to mention the placement of the webcam, which is bang in the middle on the chin of the screen. We’ll show you a couple of samples to highlight just how bad this is. 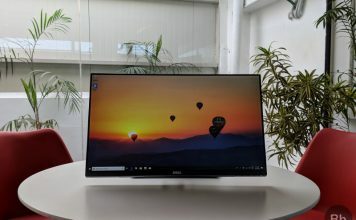 Dell has decided to place it back on the top of the display for the 2019 Dell XPS 13 model, so the 2018 XPS 15 9570 might be the last XPS to have the chin-cam. 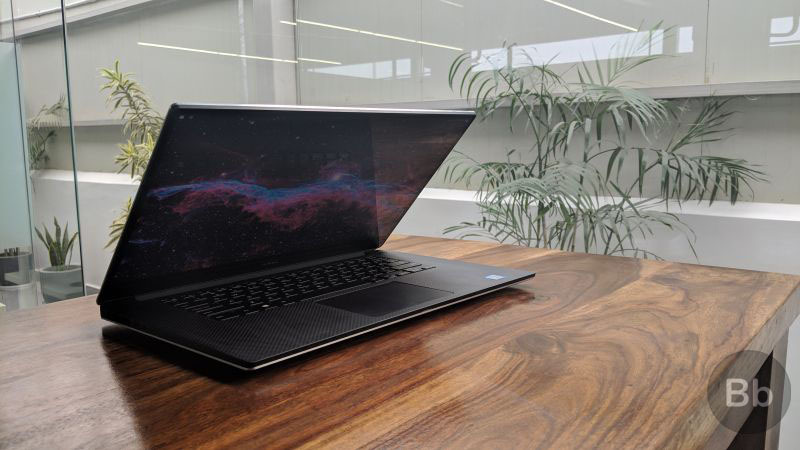 While Dell advertises this laptop as a thin-and-light productivity machine, the reality is it’s anything but light. At nearly 3.5 kg, it’s clearly a very heavy machine, even in the premium segment. The dense build and the materials makes it feel heavier in the hand, so it’s not the most portable laptop in hand. 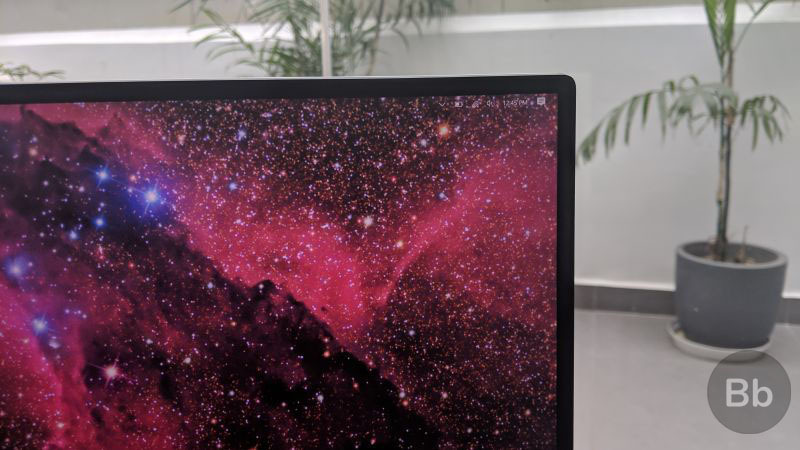 The 4K IPS panel on the XPS 15 9570 is simply stunning. The brightness, viewing angles and color reproduction is just brilliant, and the bezel-less look just makes everything seem a lot more immersive. This being a 4K panel, you will have to adjust the Windows scaling to get UI elements in the right size for your eyes. Out of the box, Windows puts everything in 200% scaling, which makes little sense given the screen real estate on offer here. I turned it down to around 150% for the best viewing and productivity experience for multiple windows. The display is rated for 100% Adobe RGB color gamut and comes with Dell PremierColor software, which is said to automatically convert low-fidelity content for more vibrant on-screen colors. 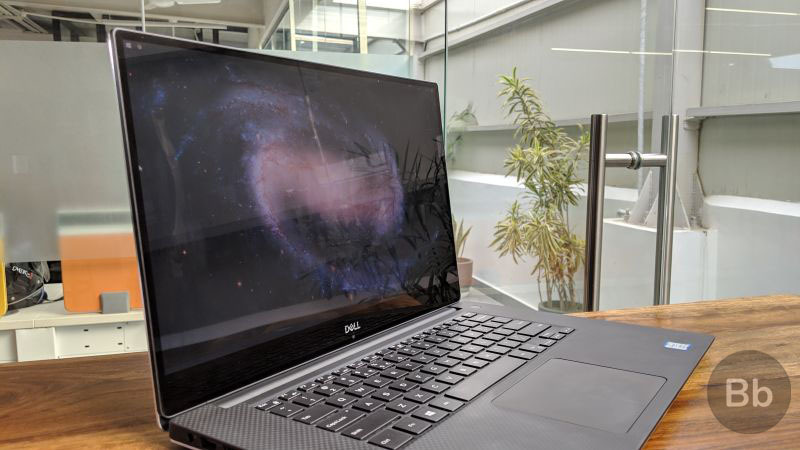 Despite being a glossy panel, the XPS 15 9570 does a good job of keeping reflections away when lights are shining overhead. The peak 400-nit brightness is also great for outdoor use. I rarely found a situation where the display didn’t make things pop. Since this is a 4K touch panel, interacting with your fingers and stylus is a possibility. I didn’t find myself using the touch functionality all that much, given that this is not a 360-degree form factor. Also, considering that the display does not fold out fully flat, you can’t really use the touch screen as a presentation or interactive tool in front of others. The display supports 4K HDR content as well, so if your internet speed is up to the task, you can stream such content from YouTube, Netflix or Amazon Prime Video. It takes up a lot of bandwidth, but everything looks so stunning that you probably would be too engrossed to notice the data being consumed. 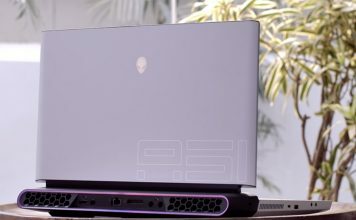 Watching videos on this laptop is a delight, and thanks to the high-end CPU, you can not only watch 4K videos with ease, but also edit them and see the output on the screen in the native resolution. Another aspect that makes this laptop a joy for watching movies are the speakers, which produce rich sound with no distortion or clipping. I was surprised to see just how well the speakers managed to eke out all the detail from a flac version of Charlie Mingus’s The Black Saint and the Sinner Lady. It sounded terrific, unlike any other PC I have tried it on. Dell has added Waves MaxxAudio Pro for tuning the audio, which doesn’t really make that much of a difference. The speakers are plenty loud and have great sound right out of the box. 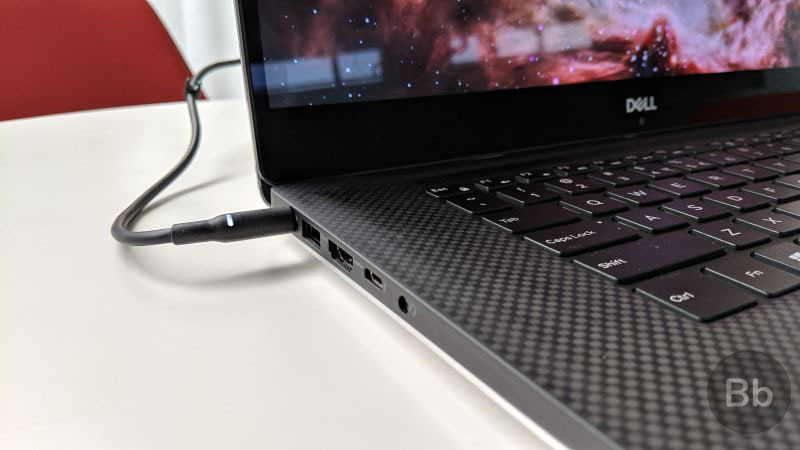 The irony of premium laptops these days is that you will find all the computing power but few ports to connect accessories. Dell has gone with a more robust collection of ports for the XPS 15 9570. On the left, you get a barrel-plug charging port, a full-sized USB type-A port (Gen 1 with PowerShare), a full-sized HDMI 2.0 port, a Thunderbolt 3 with PowerShare, DC-In & DisplayPort (4 lanes of PCI Express Gen 3) and the 3.5mm combo headphone/mic slot. On the right, you will find a full-sized SD card reader, another USB 3.1 Gen 1 with PowerShare port, the signature Dell battery gauge indicator and a Noble lock slot for security. That’s a whole lot of ports and you can hook up a dongle with VGA, or Ethernet to the Type-C port to extend this selection. 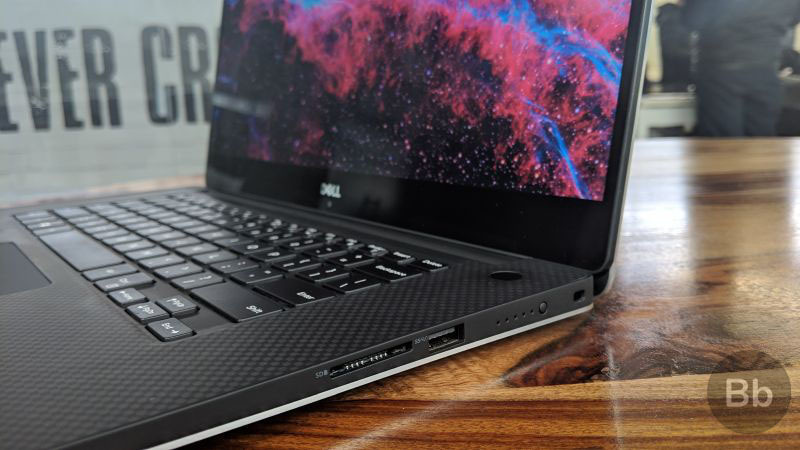 Overall, I would rate Dell’s effort in this regard as higher than most other competition, especially the full SD Card slot, which will come in handy for photographers. Dell has added the Killer 1535 802.11ac 2×2 WiFi and Bluetooth 4.2 instead of the Intel WLAN card into the XPS 15 9570. This offers great performance on most networks and the pre-installed Killer Wireless utility lets you intelligently allocate bandwidth to the applications that need it the most. 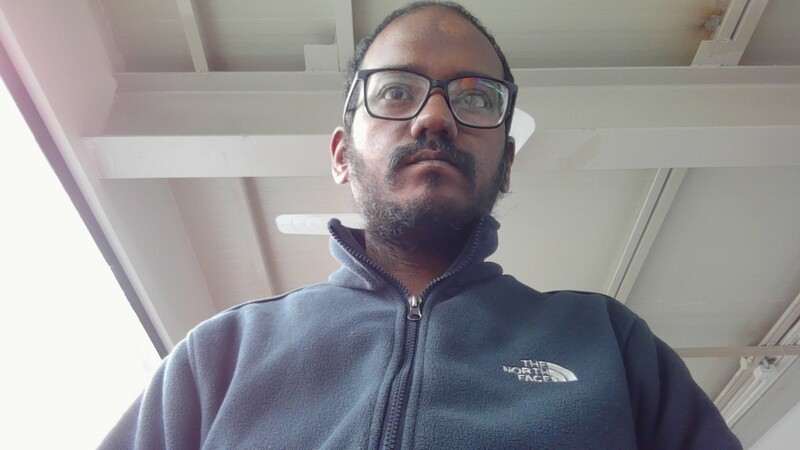 You can also connect an Ethernet cable with a dongle and let the system decide whether it wants to use Wi-Fi or the LAN for the internet. The Killer Wireless Control Center utility makes it possible for the Dell XPS 15 9570 to stream video faster than most other PCs I have used. You can open the app and easily set the priority for each app that’s using the internet, making streaming much faster than otherwise. The first thing I do when I get a new laptop is to type a lengthy stream-of-consciousness take on what the keyboard is like. I usually just open up Notepad and start typing everything I can think of when using the keyboard. In this case, the .txt file ran quite long as typing on this keyboard is just too good. 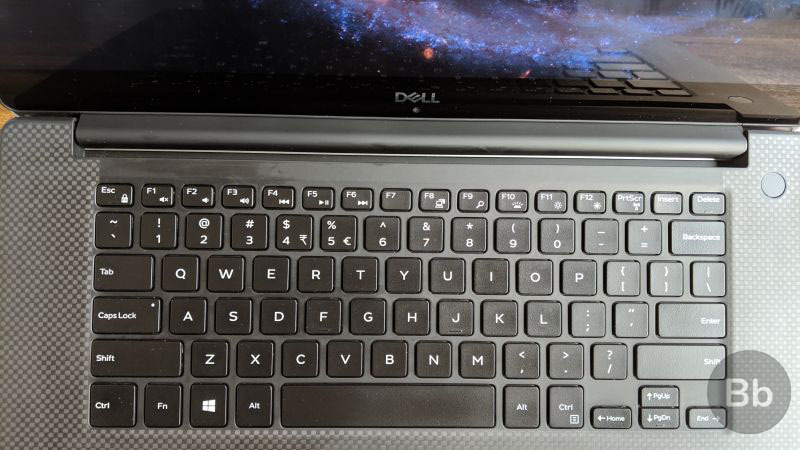 To Dell’s credit, the chiclet-style keyboard is one of the best you can use on a laptop these days. The keys have a good amount of travel, almost perfect for touch-typists and they don’t require too much actuation force to use. The backlit keyboard does not have a full number pad, which you may have expected on a keyboard deck this large, but that’s something you have to live without. The carbon fiber palmrest makes typing for long hours less painful than a simple aluminum deck might have. To complement the excellent keyboard, the large and spacious trackpad on the XPS 15 comes with support for Windows Precision drivers and all of Windows 10’s gestures, which are quite cool. The whole trackpad is clicky in the XPS 15, but there is also a demarcated area for left and right clicks. My only complaint about the trackpad is that it tends to collect oil and smudges from your fingers over time, which means you have to wipe it down every now and then, to use it without that sticky cursor feeling. 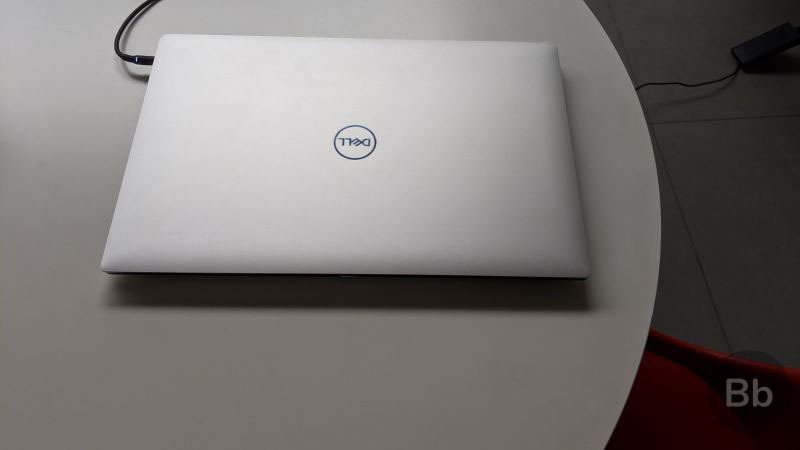 While the XPS 15 does not have an IR camera to enable face recognition for Windows Hello, it does have a fingerprint reader right on the power button, just where it should be. It works very well and is quite speedy. 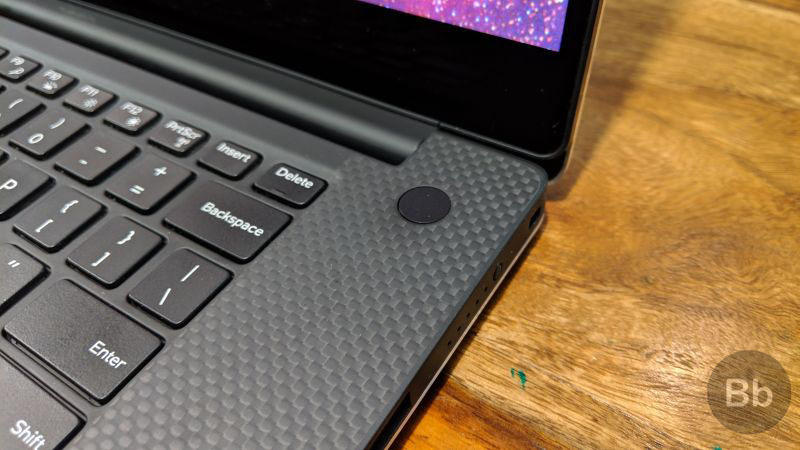 You need to scan your finger after you turn on the PC, which is fine by me, but some users may want the PC unlocked right after you touch the power button to turn it on – like in the Huawei Matebook X Pro. 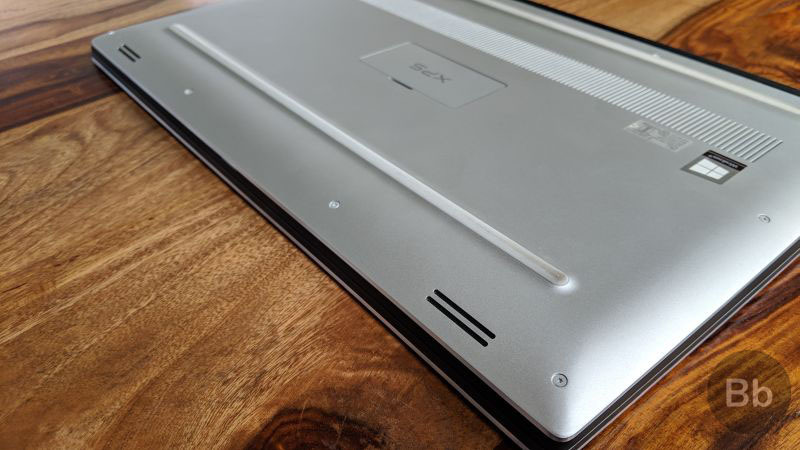 To say that the Dell XPS 15 chomped through everything thrown at it would be an understatement. It did that and had room for more too. Let’s face it: the high price of this machine is largely down to the component cost of the Core i9, which Intel is undoubtedly selling at higher margins to its OEM partners. With a price gap of nearly Rs 80,000 between the two models, you just have to consider what you would be using the XPS 15 for. The Core i9 is definitely worth the extra money for its 4K editing chops and faster compute performance in design and engineering apps. We also tested a few popular games from our Steam library on this PC, even though with a slow 4K screen and a 1050 Ti, it’s not meant to be a gaming PC. In Monster Hunt: World, we got an average of 41-43 FPS at 1080p with Medium settings, which is not shabby at all. Admittedly, the experience was far from satisfying and there was some choppiness which could be down to the GPU used here. In High settings, we got around 31-32 FPS at 1080p resolution. When it came to PUBG, the laptop gave us 30-32 FPS at High settings in 1080p resolution. The 4K screen made Vikendi look absolutely fantastic, although the game itself ran like dog on the PC in High settings, especially when you had enemies nearby or when you are trying to vault windows or transitioning between vehicles and running. The GPU simply couldn’t keep up with the beauty of the new PUBG map. Thankfully, we got around 45-55 FPS in Low graphics settings, which made things look less awesome, but the gameplay itself was much improved. 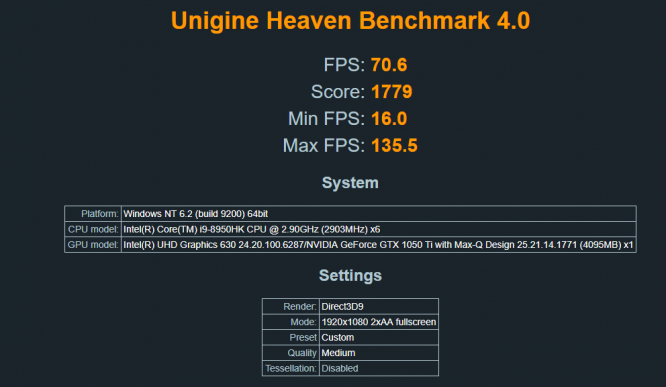 We put the machine through our usual array of benchmarking software. 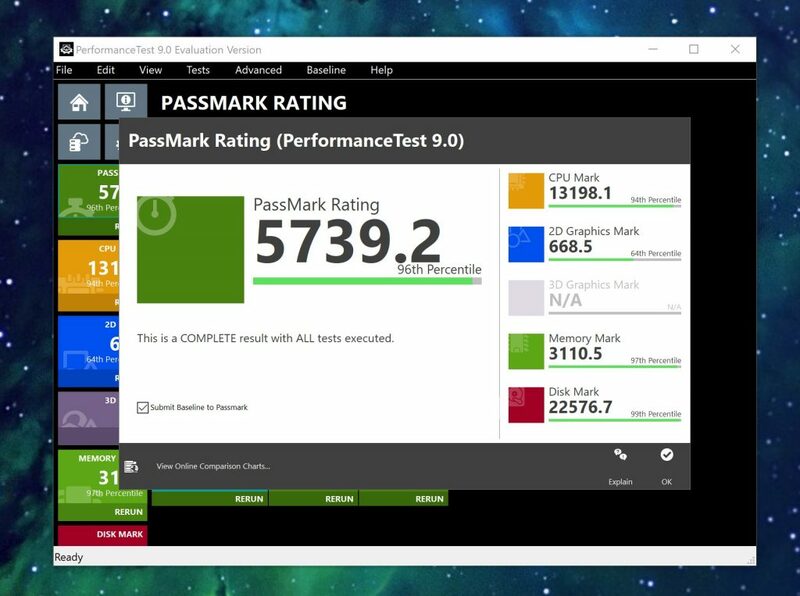 First up was PassMark, where the XPS 15 9570 finished up in the 96th percentile with an overall score of 5739.2. In CPU Mark, only the 16-core AMD Ryzen Threadripper managed to topple the Core i9 8950HK, which handily wiped out the rest of the competition. In Cinebench R15, the laptop got 72.93 fps in the OpenGL test, 521cb in the CPU score and 105cb in the single-core tests. 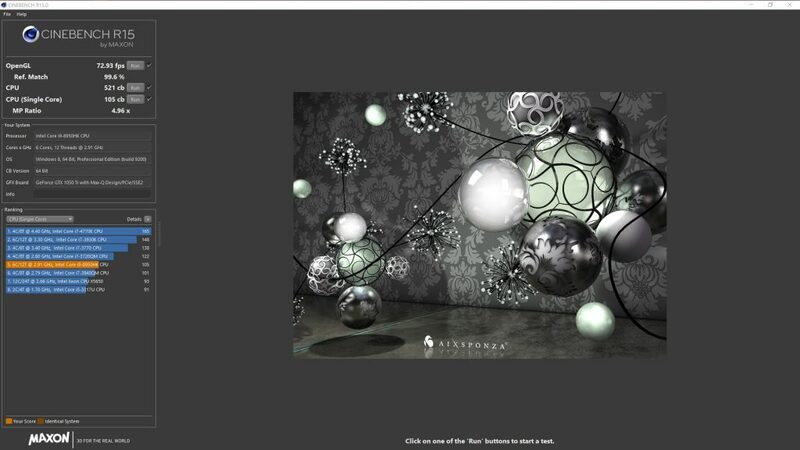 In Unigine Heaven Benchmark 4.0, the XPS 15 got 70.6 FPS in the full HD full screen mode with 2XAA. It scored 1779 in the test with a max frame rate of 135.5 FPS. 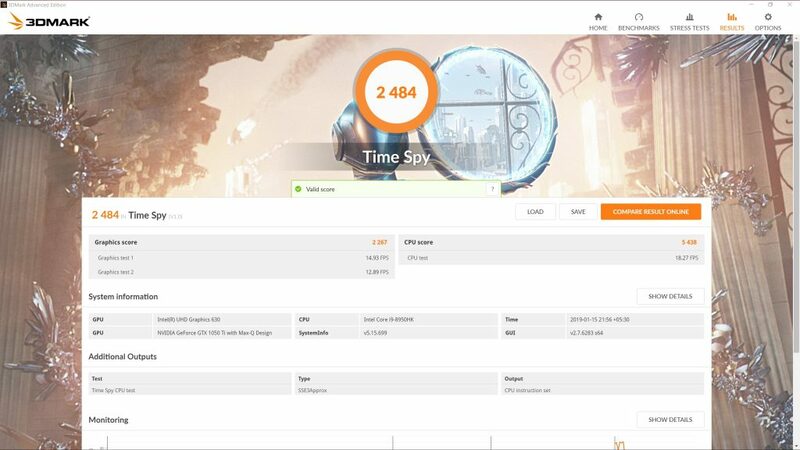 In 3D Mark Time Spy 1.0, the laptop scored 2484 in the graphics test and a superb 5438 in the CPU test, with an average of 15-18 FPS. 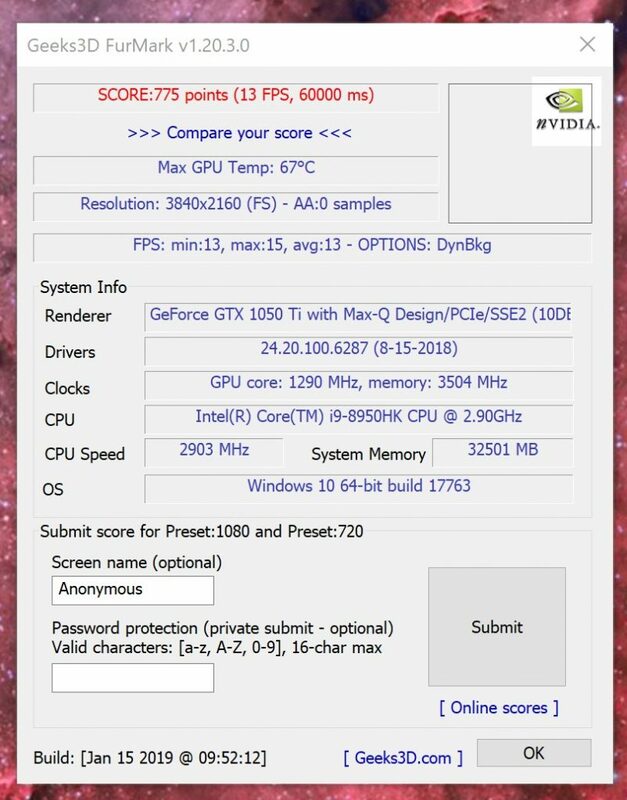 In Furmark, the XPS 15 9570 score 775 points with a max FPS of 15. 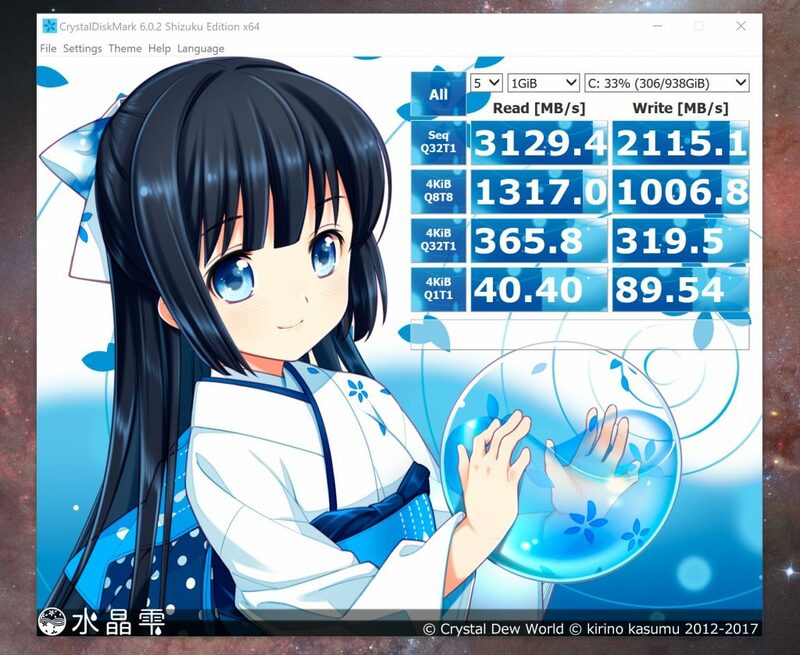 We also ran CrystalDiskMark to check how well the 1TB PCIe SSD holds up and as you can see it delivers some astounding trasnfer figures and this shows in real world performance as well. In real-world performance, everything was breezy, and the XPS 15 9570 seemed to be overkill for typing articles and editing and resizing photographs. Even so, everything seemed to flow much better with this laptop. There was no freezing up; no unexplained delays in loading up apps. Even the benchmarking apps worked with great aplomb. Video editing went smoothly for 1080p 60fps footage, but 4K 60fps does tend to push the fans into overdrive. The laptop is not ready for full-time duty of 4K editing, which might be explained by the GPU used here. Dell has pushed the battery capacity to the absolute limit (legally speaking as laptops with more than 100 wHr batteries are not permissible in US flights) with a 97 wHr battery unit in the XPS 15. As a result, you get some really good endurance from this machine. 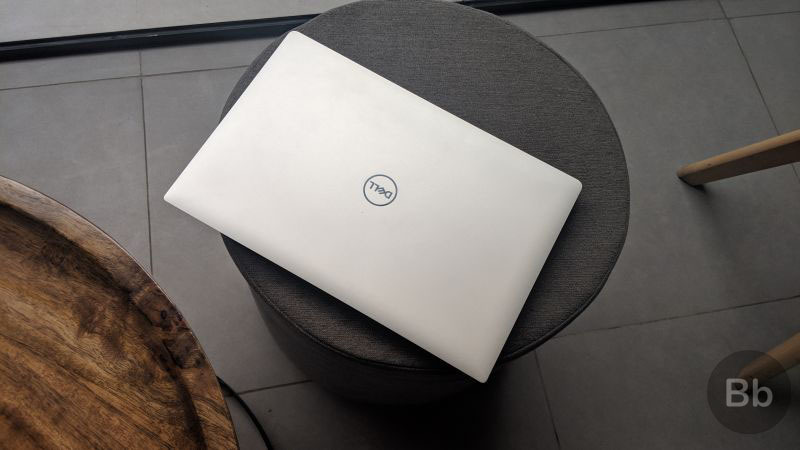 I would say the Dell XPS 15 provides Ultrabook-like battery life with all the performance of a desktop PC, which is exactly what you want when you have such a large battery unit inside. Under normal usage i.e. with 10-12 tabs in Chrome (including 4K videos), Photoshop and other essential apps running, the laptop easily lasted me a typical work day of 9-10 hours with some juice to spare when I got back home. This is excellent when you think about the power inside the XPS 15. 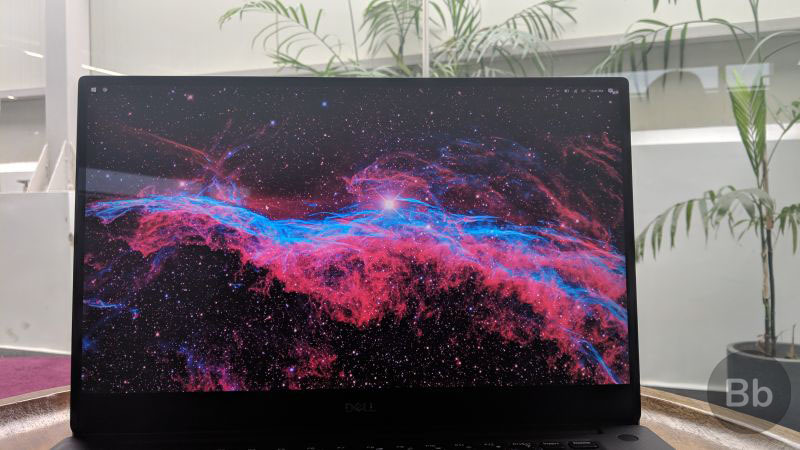 When it was put under stress, such as during benchmark testing and gaming, the Dell XPS 15 petered out in just over 5-6 hours. This is also quite good, and you are likely to get similar endurance when editing 4K video on this laptop. I would, however, always keep the power brick in my bag – for longer work days. Charging speed for the Dell XPS 15 9570 is not exceptional. The laptop goes from 0 to full charge in just over 2 hours, which is not bad, but it’s not blazing either. 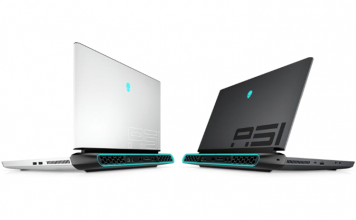 We would like to see this being pushed up in the next-gen version, with some kind of fast charging tech, which would absolutely make the XPS 15 a long-lasting machine. As with rival Core i9 systems, the Dell XPS 15 suffers from overheating and fan noise when put under intense workload. But in regular usage, the XPS 15 remains cool, calm and collected without overheating or too much fan noise. This is great because past generations of this laptop have been known to have coil whine and overheating issues. The good cooling on the XPS 15 9570 allows you to push the CPU and GPU to run smoothly at with very minimum throttling and low heat emissions. 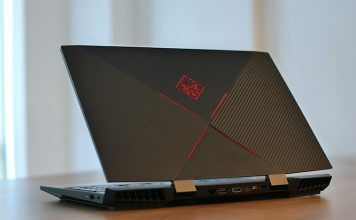 The laptop hovers just over 40-degrees Celsius during gaming or benchmarks, but remains well under that mark when you are using it for regular everyday work. 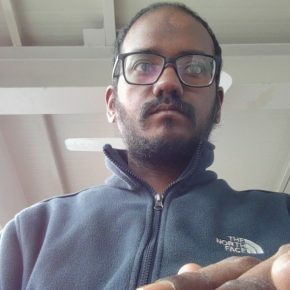 Wondering how bad that webcam placement is? It’s pretty much the only real terrible thing about this laptop. Dell XPS 15: The Best High-End Windows Laptop? 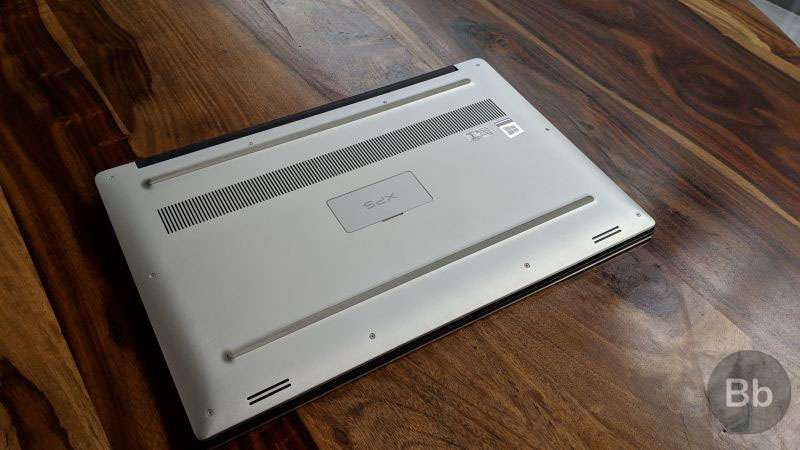 When it comes to alternatives for the XPS 15, you will not find many in the market. At this price range, we are in workstation territory and edging into high-end MacBook Pro models. Astoundingly, you will find the Dell XPS 15 9570 with Core i9 laptop on Amazon India for a scarcely-believable Rs 3,39,000, while Dell has listed it for around Rs 2,15,190 (+GST) on its official website. In comparison, the base variant comes for Rs 1,36,390, and still provides you with plenty of horsepower. In many ways, the Core i9 model is too niche for most users. 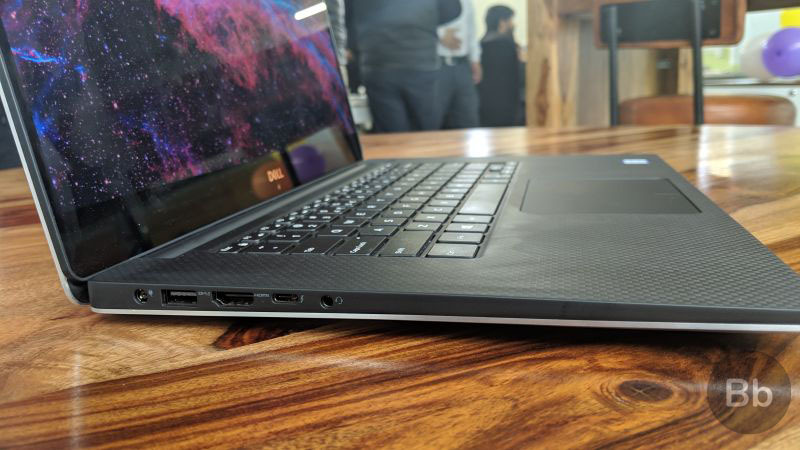 The other Core i9 model under Dell’s portfolio is the G7 gaming laptop, which we thought was an excellent notebook for gaming, but its thickness may not be for those looking for a portable workhorse. You can get it on Amazon India for Rs 1,56,300. 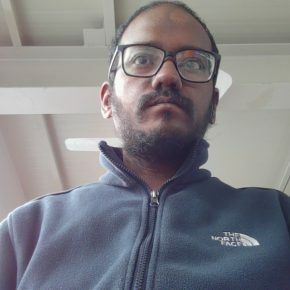 The MacBook Pro with the Core i9 is not even available in India, and it has its fair share of throttling and heating issues. So the real question is whether the almost Rs 80,000 premium for the Core i9 is worth it for your use case. Honestly, I would say that if you buy the XPS 15 with Core i7 and a decent 4K monitor, you will still end up saving some cash to buy other accessories. Thanks to the Thunderbolt 3 port, driving the 4K display should not be a problem. You may have noticed I didn’t really go into whether you should buy the XPS 15 or not. 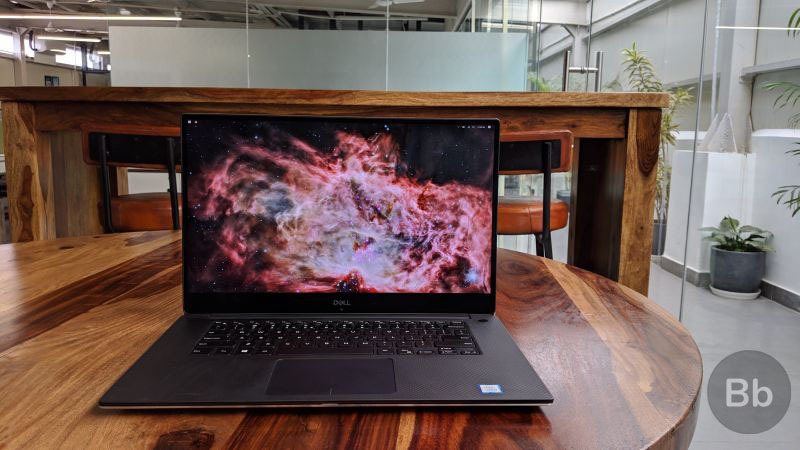 If you are looking for a high-performance productivity laptop with plenty of power in a thin package, then this is really your only option besides a MacBook Pro. And within Windows, you don’t have comparable options at all unless you go for high-end Lenovo ThinkPad laptops geared for business users. 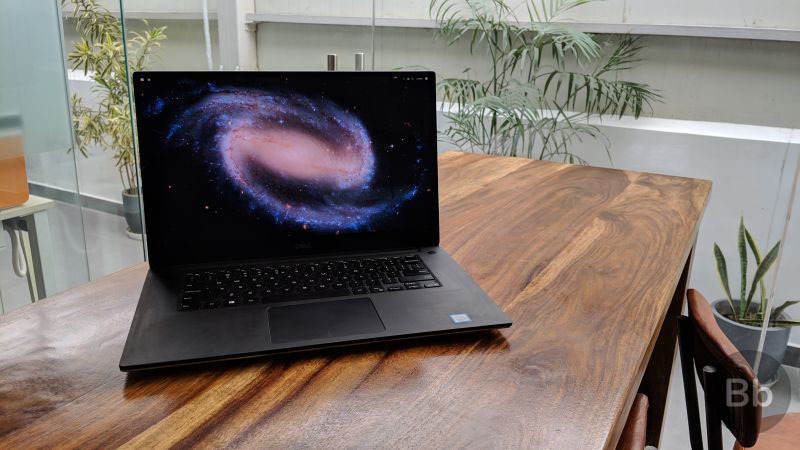 At the moment, Dell has cornered the Indian market on beautiful high-performance laptops for Windows users, and the XPS 15 9570 is a prime example of this dominance. 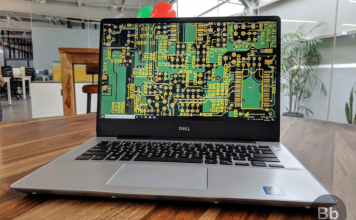 In 2018, Dell added the hexa-core Intel Core i9 processor to the XPS 15 to take things to a whole new level. This variant with a stunning 4K screen, 32 gigs of DDR4 RAM and Nvidia GTX 1050Ti graphics is overkill in the name of a computer. Is this the best that Windows has to offer? Dell P2418HT Multi-Mode Touchscreen Monitor Is Versatile and Unique, but Is It Worth It?